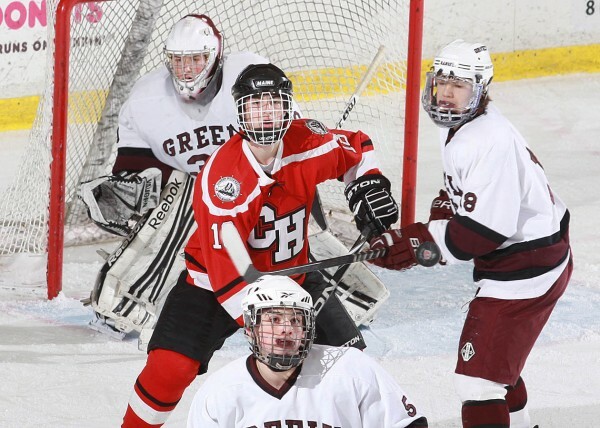 Greely goaltender Kyle Kramlich looks on as teammates Matt Ames (right) and Brian Storey (foreground), along with Grayson Szumilas of Camden Hills (center) watch the puck in in last season’s Western Maine Class B final in Lewiston. Szumilas has helped Camden Hills to a 7-0-1 start this season. The Camden Hills Windjammers played in their first Western Maine Class B hockey final a year ago in just their seventh year of existence, but Greely High School of Cumberland upended the Windjammers 7-1 en route to its second straight state championship. That loss has motivated the Windjammers to go further this season and they are off to a 7-0-1 start, which puts them atop the WM Class B standings. The only blemish is a 6-6 overtime tie against a good Waterville team in which Camden Hills squandered a 5-2 lead. The Camden Hills program is flourishing. Enroth, who is in his sixth year as the head coach, has 30 players in his program, which enabled him to field his first-ever junior varsity team. “Most of the schools that are successful over the long haul have JV programs,” said Enroth. Camden Hills has allowed just 15 goals in its eight games while scoring 59. The Windjammers are again sparked by one of the state’s most prolific lines. Senior center Grayson Szumilas, senior left wing Jack Orne and junior right wing Simon Lydon have combined for 83 points. Szumilas has 15 goals and 17 assists for 32 points, Orne has 17-15-32 and Lydon has 6-13-19. The Windjammers also have a productive second line featuring fourth-leading scorer James Annis, a junior, between sophomore Jonah Cameron and either Perrin Bonner-Ganter or speedy Kieran Lydon, Simon’s younger brother. Bonner-Ganter and Kieran Lydon are freshmen. Bonner-Ganter is also the fourth line center. An effective all-sophomore checking line consists of Austin Gallant, Nick Czuchra and Chase Matteo. “They cycle the puck well,” said Enroth. Hard-nosed senior Parker Lawson headlines the seasoned defense corps. His partner is junior Josiah Simko with senior Nick Bennett and sophomore Matt Prescott making up the second pair. The tandem of junior Luke Noonan and sophomore Nick Tassoni also gets some good minutes and supplies depth. Sophomore Jet Magri returns as the No. 1 goalie and Zach Hand, another sophomore, backs him up and has already posted three shutouts. “They’re a great skating team. They fill the lanes really well,” said John Bapst coach Gene Fadrigon, whose team played Camden Hills in a preseason tournament and will entertain them next Monday. He also said the top line of Szumilas, Orne and Simon Lydon is among the best in the state. “They come at you for 45 minutes,” he said.